Fourth Row Center: Film Writings by Jason Bailey: In Theaters: "American: The Bill Hicks Story"
And it should be noted that the film is pretty conventional from a structural standpoint; it doesn’t look to replicate its subject’s innovativeness. But the content is, by a good stretch, intriguing enough to keep us engaged. This is especially true in the closing sections, after he received his diagnosis, but told few people and kept working (now with even more purpose). There’s a power to those performances, a sense of wanting to say what he could while he could, and the filmmakers wisely let him speak mostly for himself. That’s the smart play. 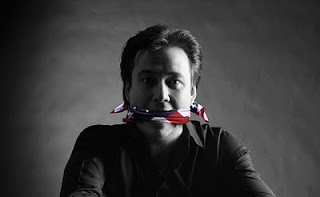 His words continue to inspire and provoke, and American: The Bill Hicks Story is an affecting and compelling tribute. "American: The Bill Hicks Story" opens Friday, April 8th in limited release.